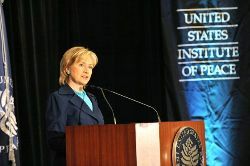 HRC delivered the Second Annual Dean Acheson lecture yesterday at Renaissance Mayflower Hotel in Washington, DC (Remarks | October 21, 2009 | Video). Last year, DOD Secretary Robert Gates delivered the inaugural lecture for the U.S. Institute of Peace. The USG in recent months supported a young entrepreneurs’ “Incubation Center,” provided bomb disposal equipment, donated ambulances, sent Pakistani students for US exchange visits and more. None of these seemed to have penetrated the very crowded traditional press that is considered among the most outspoken in South Asia. BBC reported that there were 17.5 million internet users in the country as of March 2008. A growing number of bloggers and social networkers write about politics. These users of new media have been vocal and quite active not only about the expansion of the US Embassy in Islamabad but also about the Kerry-Lugar bill. Check this one here, here and here. The U.S. Embassy in Islamabad, in the meantime, lacks a vigorous presence online. Except for that template website that we see in most embassy websites, and the videos piggybacking on materials provided by America.gov, its only other online engagement appears to be its connection to Co.Nx for its webchats, also via America.gov. I have not seen any material specifically geared towards an online dialogue addressing hearts and minds issues in that country. Well, I’m actually very glad that you raised your questions and made your comment, because I think we have, as a government, not done a very good job in responding to what you rightly call propaganda, misinformation, even in some instances disinformation, about our motivations and our actions in Pakistan. That became clear to me as we were doing our review, and I saw how often there were stories in the Pakistani media that were totally untrue, but we were not responding as effectively as we need to. We have, under Judith McHale, our Under Secretary for Public Diplomacy, undertaken a very thorough analysis of what better we could do, and we are moving very rapidly to try to fill that void. We have a new team going in to Pakistan. A Public Affairs officer may be already there. We have adopted a new approach, which is we do not leave any misstatement or inaccuracy unanswered. It may be that people won’t believe it at first, but we intend to counter a lot of this propaganda with the best weapon we have; namely, the truth. And we’re going to be much more aggressive in interacting with the Pakistani media. This is going to take time. This is not something you can fix in a news cycle or by just snapping your fingers and asking people to believe you. You have to go at it day in and day out. And I was, frankly, quite surprised that we had not done much of this in an effective manner. But we’re going to remedy that. And there’s no guarantee that people will pay more attention to what we say, but at least we’re going to be in the mix and we’re going to be in the mix every day in getting out information that can be used by those who understand that the United States is hoping to be a good partner for not just the Government of Pakistan, but more importantly, the people of Pakistan. We’ll be in the lookout on what changes the new public diplomacy team makes when they get to Islamabad.